Buy a Goat today to help an African mom change the lives of her children. For children who are at risk of malnutrition, the complete protein derived from goats is critical to improving their health. Goats also provide a source of milk and cheese for families, which can be consumed or traded for other food produce. Goats are distributed through Village Savings and Loans Associations – microfinance programs that teach women effective animal care and breeding techniques as part of overall literacy and numeracy, business and marketing training. While gender equality training is an important part of our programs, many women in sub-saharan Africa are still prevented from owning land. Fortunately, goats take up little space so when you buy a goat you're giving a mom financial independence and the chance to lift her family out of poverty. Goats are great at producing other goats; quickly and relatively easily. As a result, one goat quickly becomes the foundation for a growing herd that offers families income for the long-term either by trading up to other livestock such as cows or using the income to start a small business (see Woinshet's story below). 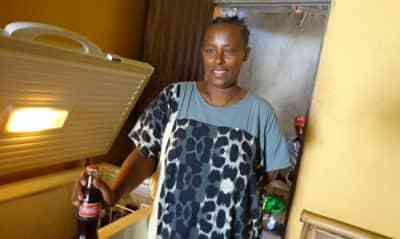 I sold 10 goats for 6,850 birr, and bought a deep freezer and fridge and started selling cold drinks. The goat you purchase will be sourced locally, i.e. as close to the recipient as possible. This approach provides an extra boost to local economies while keeping transport costs to a minimum. With each goat you buy you will be able to select a FREE Printed, PDF or eCard to send to a special somebody. Card designs include holiday (pictured), goat-themed, birthday, teacher, wedding plus many more. You can also buy a goat without selecting a card. When you order a goat online you will immediately receive a charitable tax receipt in PDF format by email. You can pay for your goat donation using a credit card (Visa, MasterCard or Amex) or via PayPal. Canadian Feed The Children is a registered Canadian charity. We are an award-winning organization. We were named as a Financial Post’s Charity of the Year in 2016 and 2017 and a Charity Intelligence Top 100 Rated Charity in 2018. How can I pay for my goat? You can purchase goats online using MasterCard, Visa, American Express or PayPal. You can also buy a goat by calling 1-800-387-1221 between 9am – 5pm EST, Monday to Friday. How does buying a goat help children? The communities we support have identified Goats, like every other gift listed in our Best Gift Ever catalogue, as being vitally important to ensure children’s health and well-being. Canadian Feed The Children along with our local partners provide goats, school supplies, water taps, fish farms, etc as part of our broader programming initiatives. 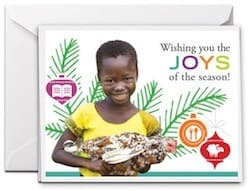 Goats, or any gift you purchase, will benefit the communities we support in our countries of operation: Bolivia, Canada, Ethiopia, Ghana and Uganda. How are the goats delivered to recipients? Rest assured that the goats you buy won’t be put in the cargo hold on Air Canada to be shipped from HERE to THERE. That’s not only cost prohibitive, inefficient and inhumane, but it also prevents local, sustainable economic development from happening. That’s the last thing we want to do. When you buy a charity goat your purchase will be sourced and distributed through CFTC’s local partners in communities that are running agricultural income generation programs. That means goats will be bought locally and delivered to communities in Ethiopia, Ghana and Uganda. Are goats primarily used for their milk? The value of goats is sometimes questioned based on the assumption that their primary value is for the milk they produce. People quite correctly raise the issue of high lactose-intolerance levels among Africans. 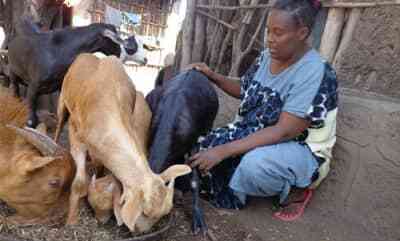 In fact, goat meat is a staple in both East and West African diets. Therefore, goats are primarily used for their meat, not for their milk (at least, not in Canadian Feed The Children’s programs). Are goats kept in humane conditions? Small family farms and individual families receive the goats we distribute. These goats are part of agricultural training and livelihoods programs that offer broad-based support. The goats are distributed through Self-Help Groups and Village Savings and Loans Associations – microfinance programs that teach women effective animal care, raising, and breeding techniques as part of overall literacy and numeracy, business and marketing knowledge. Community agricultural agents work with women and men to ensure that they have what they need to feed, house and sell their livestock. No one benefits if the recipient doesn’t know how to care for her goats and to grow her herd into a sustainable source of family income. When I buy a goat will I receive a tax receipt? When you order a goat online, you will receive an immediate charitable tax receipt in PDF format by email. When you order a goat by phone, you can choose to receive an electronic receipt or have one mailed to you, usually within two weeks. Canadian Feed The Children’s charitable registration number is 11883 0983 RR0001. See the Government of Canada’s policy statement for charitable tax receipts for more information about charity tax receipts. Is HST charged on my goat purchase? Your purchase of a goat is a donation to Canadian Feed The Children, so no taxes are charged.